Interesting information and a new joystick! I replaced the joystick that was in my RC28 slow bullets machine yesterday! A new Wico, which I found out the old one was not a wico, and I was streaming again tonight. Had a great game, my first man went just shy of 40,000 points, however being tired and not having slept well last night caught up to me. I managed to achieve a score of 60,000 points even which I'm actually happy with, however I need to fix some of my mistakes to break the 100,000 point barrier. On a different note I found out the following informaion about my machine when I fixed the service switch today! I've played my RC28 Slow Bullets machine for just over 32 hours in the last 6 weeks, score over 2,636,170 points across 216 games. I'd say about 30 of those game are bogus as I was testing joysticks, or letting my kids play. I did order a replacement joystick shaft today, my old joystick had a 4" long shaft that I got use to using and the Wico I installed is only 3.5" so I fell like I'm holding the joystick funny. Don't know if that will help my scores or not but we'll see. One amazing highlight in my game tonight! I felt like the entire time I played tonight I was having difficulty aiming my shots and moving my humanoid. Honestly I thought I was just tired! I'm relieved to find out the solder broke on the leaf switch, its a simple fix but that ends my night of gaming! I look forward to playing more Berzerk tomorrow night! Got Evil Otto to pounce on my old high score! 74,060 points tonight! I had an amazing game of Berzerk R28 slow bullets tonight. I achieved a score of 74,060 points, just destroying my previous high score of 58,230! Here's the almost hour long video of me playing! Warning at the end I'm very loud with my celebration! I tried to focus on the game and not the score which turned out to be some amazing advice. When the game finally ended I didn't have a clue as to what my score was! Also on an interesting note I encountered the empty maze twice tonight in slow bullets and survived both encounters! I also played a round of fast bullets Berzerk tonight and ended the night with playing a couple of rounds of Frenzy. Overall I had a wonderful time playing Berzerk and Frenzy tonight. Rough night but still got a new high score of 58,230! By the time I got around to playing Berzerk tonight I was honestly too tired to be playing. I didn't sleep all that well last night and I could tell it was taking a toll on me tonight. I had 3 games where my final score was under 10,000 points. However that being said, I had one game that was amazing. I achieved a score of 58,230 points. I played the entire game very well except for my last man, I had only been playing with that man for about 5,000 points and I died in just the dumpest of ways. I missed a critical shot that I couldn't afford to miss and ultimately that was my downfall. I'm confident that a 75,000 point game of Berzerk will happen in the near future and furthermore a 100,000 is beginning too look like a serious possibility. I want to say one more thing about Berzerk tonight. I truly love this game. I was too tired to play the game seriously tonight, but that doesn't change the amount of fun and enjoyment I had playing Berzerk tonight. The game constantly surprises me, and I surprise myself with what I've learned and how well I'm beginning to get at this game. I'm constantly pushing to reach that next level, that next barrier to break through, which at the moment is 60K. This games challenges you! If you stick with it, it will force you to make yourself better. I can remember the first 3 days I played slow bullets in March, I was getting 20,000 points and I was just so freaking happy about it, because at the time my high score in fast bullets was and still is 15,050 points. Its not even May yet, and I'm on the brink of tripling that score. Watching old video's of myself playing, I can see where I've changed and adapt my strategy to allow me to get farther in the game, and I know there is still even more for me to learn. Berzerk is hands down my favorite game of all time. I've owned many console system, computer systems, and now I can say I've owned and played a large variety of arcade machines as well, but no game will be as special to me as Berzerk. I hope everyone has a goodnight and hopefully I'll get to play some more of this wonderful game tomorrow. Robot Kill-Off: Training 1st night! new high score! 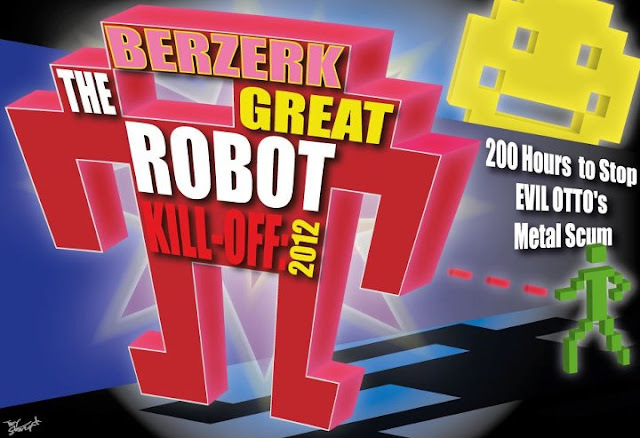 So last night was my first night of training for the upcoming event "The Great Berzerk Robot Kill-Off 2012". My goal is to be able to get around 100,000 points in Berzerk RC28 slow bullets by the time the competition starts in 63 days. Last night I played several games however my last game was my best. I achieved a score of 55,010 points. I'm confident that I'll reach my goal, I just need to continue to train so I'm going to try playing Berzerk everyday! Berzerk ran out of robots? Tonight I caught something on camera that I didn't think I would ever see again! I exited a room and the following room had no robots in the maze, I ran like crazy for the bottom exit escaping before Evil Otto could take his revenge! Here's the clip of the empty robot room! I would not say this is a glitch, if I had to guess this is done by a random number generator that dictates the number of robots that are in a room. This is a very cool and terrifying thing to see in person! Joel West - "Start Practicing for THE GREAT ROBOT KILL-OFF: 2012. You have 64 days to train in all variations of Berzerk. Official Rules will be available by 4/30/12...start playing Berzerk!" Went Berzerk and jumped into the Frenzy! I decided to switch things up a little bit and I put my Frenzy ZPU-1001 board into my Slow Bullets Berzerk machine for a little while. Talk about a completely different game. I love Frenzy, everything is going on at once, you see a Mama Otto and there are WAY more robots on the screen all at once as well. A truly great game, but I'm really no good at it yet, but I hope to get better! After playing about 30 minutes of Frenzy, I turned off my machine and put my Berzerk ZPU-1000 slow bullets board back into the machine. Whats interesting however is I found myself playing the best 4 games of Berzerk back to back to back that I've done in a long time. I was also able to get on my top 5 again last night with a score of 43,900 points! I feel like I'll be able to break into the 50,000 again soon with some more practice! Witnessed one of the coolest things ever tonight playing Berzerk! Well I had a productive and fun evening tonight. I setup my streaming account on Twitch TV. The url to my account is www.twitch.tv/disjaukifa. Played a couple of games of RC28 slow bullets Berzerk tonight and just had some fun, I haven't played in a while and I almost broke onto my top 5 scores! I did see something tonight that I doubt I will ever see again. On my second game of Berzerk, I was at 4,880 points with one robot left in the room. I was at the exit for the maze, and I used Evil Otto to finish kill the last robot like I normally try to do. That worked, however right as Otto killed the last remaining robot, he went into a super slow-motion bounce! I've never seen or heard of this before and it was one of the neatest things I have ever seen. Some people will say pictures or it didn't happen . . . I've got video! My high score for the night was 39,620 points. My wrist is still healing but it felt great to play some Berzerk again! Still here trying to kill some robots and now Evil Otto! So its been 16 days since my last post. I haven't been able to play as much Berzerk as I like because of a wrist injury thats healing at the moment. I did however get my final machine in my Berzerk collection, I now have what I consider the complete trio of games Stern Frenzy! I got the machine disassembled so I'm working on getting the machine back together at the moment, here is what it currently looks like. I currently have everything out of the Frenzy and I'm currently in the process of getting all the boards working and getting a cabinet side wiring harness made for the Frenzy. The monitor works very well and looks stunning, however the BSC-1000 was bad and the 3 spares I had gotten in varies trades are all bad as well so I'm waiting for another one to come in. I did play a little bit of Berzerk yesterday but I was too tired when I did it and I didn't even break 10,000 on slow bullets. Looking to play some more tonight if I get a chance! I need to break 20,000 tonight, its been too long since I have! Fixied my machine and played a couple of games! Just got back from a week long vacation which I desperately needed and enjoyed! Did something to my Berzerk RC28 slow bullets that I should have done when I first got it, I fixed the Wico joystick and got rid of the X-Arcade microswitch joystick that I had in the machine, and boy what a difference that has made. Now I see why people love their Wico joysticks so much! It's so much quieter! I've played a couple of game of Berzerk since switching joysticks and all my scores have been averaging to about 33,000 points at the moment. I got one score over 40,000, but I can't remember what it was off the top of my head. I'm going to be busy this week and weekend so I don't know how much Berzerk I'll playing this week but I'll try to get in at least one game a night! I'll post the videos of my two best most recent games once I get them uploaded to youtube!